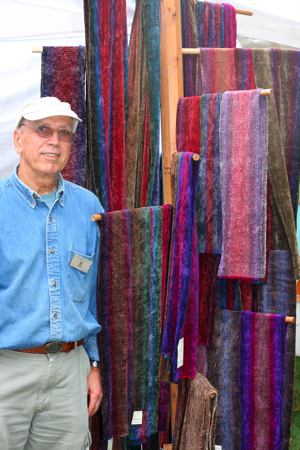 Today my art & craft column is about Jochen Ditterich, 73, of Grand Rapids, a fantastic weaver who taught me a great deal when I did an apprenticeship with him about a decade ago. I was an over-caffeinated journalism student when I fell in love with fiber art. After years of artistic dabbling, something clicked during my last semester of college. I was assigned an uncooperative loom with string heddles in an elective art class. The loom was old and difficult, but I loved the challenge of it, often heading back to the art building after hours to weave some more. The rhythm and repetition of throwing the shuttle back and forth was a surprising comfort and tempted me to postpone graduation to study art. When I stopped by to interview Jochen he offered me a healthy scone. I didn’t think it was possible for a scone to taste good and be healthy, so I didn’t expect to enjoy an oatmeal-based treat. But I ended up asking for the recipe before heading back to the newspaper. An avid cyclist, Jochen said he often takes a couple with him to snack on when he’s on long rides. As a young man he would ride 70 miles each way from his home in Germany to the Baltic Sea on a little Sunday joy ride, so his bike rides tend to last several miles. I made a batch of my own scones about a week ago and I have to say they didn’t taste as great as Jochen’s, but I’m pretty sure it was operator error. Plus, I’m used to playing second fiddle to Jochen. Now I know he weaves, cooks and cycles better than me and I’m totally cool with that. 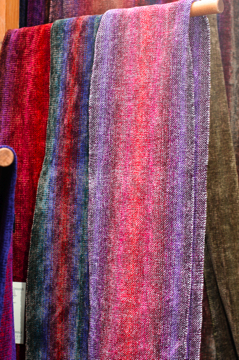 I could weave for the next 50 years and still not be able to master the way he mixes colors in his gorgeous chenille scarves. His work is widely sought after here in West Michigan. Mix well. Add flour if the batter appears too runny. Then spoon out on a baking sheet and bake in a 350-degree oven for about 20 minutes.